LEGO seems to be about to release new MINDSTORMS NXT products. MINDSTORMS NXT-G v2.0 programming environment, succeeds previous versions 1.1 and 1.0. Now with data logging functionalities, including graph viewer, make it easy to collect and analyse data from sensors. Product is available from a UK Company (Active Robots) for 45,32 GBP. You may find additional information, from a prospect at WeDo robotics webpage from LEGO Education in Australia. 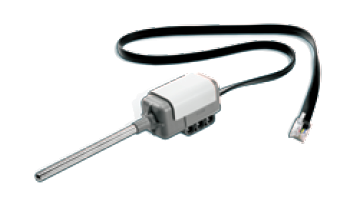 There you may see also an image for a NXT Temperature Sensor to be released soon. "The temperature sensor is a digital sensor powered by the NXT brick. Using the NXT brick and NXT software version 2.0, it can be calibrated to measure both Celsius and Fahrenheit (-20 °C to +120 °C/-4 °F to +248 °F)." It's a great new, the Temperature sensor. However, from what I see, people don't build lots of robots that include this sensor (thinking about RCX). For an official LEGO sensor, I would take more advantage with other kind of sensor. It seems to me that it sounds more intuitive to the target consumers of TLC to use it, younger people, but not that useful. Believe, it is mainly targeted for the 'LEGO Education' purposes. There it could be much more useful, and size shouldn't a big issue. I share Ricardo's opinion about many other kinds of sensor having more priority, since temperature sensors aren't common in MOCs, not to mention the existence of the RCX temperature sensor and the low cost of the convert cable for the NXT. Although immensely more expensive, I think a camera like the NXTCam-v2 would have a far greater usefulness. I wish LEGO would strike a deal with MindSensors, like they did with HiTechnic and Codatex. I've heard about some issues with Mindsensors Cam. On the other way, it rests to know if theis sensors follow the strict NXT HW specifications imposed by LEGO. Sure, that's not for nothing they have no sensors certified by LEGO. Regarding temperature sensor, it may be not so useful for NXT fans MOCs, but certainly it is of importance in portfolio of LEGO Education, where NXT also sells a lot. While I agree that for MOCs the temperature sensor might not be exciting, I have to agree with the statements of others; it's not marketed for MOCs. It's for the education market, where paired with a datalogging environment I imagine it's probably very much in demand. Personally I agree that the old sensor was sufficient (actually, in some ways, better - I suspect the smaller studded version has a much smaller time constant than the more massive probe, but I've not had the chance to test them as yet). Regarding sensors we'd like to see... yes, there's a large number. But I think something like the Mindsensors camera would have a long way to go before reaching "LEGO certified" status. For instance, it pulls as much as 42 mA (LEGO specifies no more than 20 mA per port), and the number of issues I've seen people have with it implies that as it stands right now, it would be much too great a headache for LEGO to support.